Performing live can be a bummer if you don’t actually hear what you’re playing. Luckily, the technological era has graced us with a new way of getting rid of that little problem. Here we’re looking at UM Pro 10 in-ear Musician’s Monitors. It’s granted that they are a bit expensive, but they’re our top pick today. These monitors come outfitted with a single armature driver that provides a fully-immersive dynamic soundstage with exceptionally high detail and outstanding clarity. They’re incredibly compact and boast an ergonomic design, which ensures snug fit at all times. The beautiful MMCX cable they also come supplied with is incredibly durable as it features a aramid fiber reinforcement. Out of the box, you’ll get the Westone UM Pro 10 monitors, MMCX twisted cable, five pairs of silicone eartips, an exquisite true-fit foam eartips, an impact resistant monitor vault, as well as a cleaning tool. Well, there are plenty of goodies, and free things are always welcome – you’ll get plenty of eartips, a vault, and a cleaning tool completely free of charge, and that’s not what most brands can say about their in-ear monitors. Now, we really liked the professional-grade sound quality of these monitors. They’re absolutely ideal for musicians who perform live, as they have a near-perfect soundstage, as well as a dynamic range of frequency response. Frankly, the only thing we didn’t like about UM Pro 10 is the price. It belongs to the upper bracket of the “expensive” price point category. Even though it’s expensive, it does a major bang for the buck. 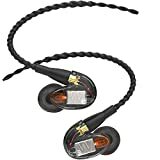 If you’re prepared to pay top dollar, these in-ear monitors will change the way you hear your music while performing live. They’re absolutely great, excelling in numerous fields of performance and packing a huge value for the money. KZ ZS10 are referred to as “Hybrid Earphones”. They feature a single dynamic and four armature drivers which provide unparalleled sound quality – listening to music is one thing, but with these drivers you’ll hear each of your bandmates onstage as if you were recording in separate studio rooms. The cable these in ear monitors come outfitted with is detachable, so packing them and carrying them around shouldn’t be that much of a deal. On top of that, the ergonomic ear hooks ensure comfort at all times. If we’re to summarize how they perform in a couple of words, the ones we are looking for are “pure power”. They’re outfitted with bleeding-edge technology, and it’s only natural that they excel in numerous fields of performance in turn. They are expensive, although not as much as Westone’s model. The only real issue is the durability – the cable is sturdy, but the monitors themselves aren’t. Any live musician who wants to redefine how they hear themselves onstage should give KZ ZS10 a shot. These in-ear monitors are more than worth the money, and they provide high-fidelity sound like no other. In all truth, trusting an obscure brand is what most people would shy away from – we’re here to bust some prejudice, and hope you’re onboard. 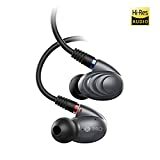 Fioo’s F9 Pro earbuds are professional-grade in-ear monitors outfitted with three drivers – the main is a 9,22 dynamic driver that provides exceptional lows and heavily accentuated highs. Though they’re wired, the cable is detachable and outfitted with special MMCX connectors, which makes replacements and upgrades an easy job. What’s best about them is the huge level of frequency response – the range goes up to astounding 40 kHz, and you can expect quite a lot from them. On top of that, the sound isolation they provide is great, and you can further enhance it if you use the gratis eartips that come along. While we’re at it, you’ll get several bonus complementary features – the package includes twelve pairs of quality ear tips, a highly durable and waterproof easy carry case, as well as a second water-resistant carry pouch made of neoprene materials. There are just two things that FiiO’s F9 pro lacks, one of which can’t be “improved” per se. Namely, the brand isn’t as famous as Sony, Bose, or Audio Technica, so most people who know what they’re looking for might skip it without knowing the benefits it provides. Secondly, the F9 pro costs quite a bit – it belongs to the medium bracket of the “moderately expensive” price point category, although it does a major bang for the buck. Excellent, professional-grade in-ear monitors that deliver full-spectrum sound. These earphones isolate most of the ambient noise, boast a huge frequency response level, and come with a plethora of gratis features. Next up are BC100. They were specifically made for vocalists who perform live, so we decided to review them for the sake of diversity. They come in a plethora of colors (10, to be precise, including black, red, blue, orange, and other), and look very hip and cool. Bsinger’s BC100 come supplied with two high-def drivers with integrated neodymium magnets that provide accurate, all-around sound. The MMCX connectors allow you to easily switch between (or replace/upgrade) the eartips or cables while the ergonomic memory hooks ensure that you feel comfortable wearing them. Basically, these in ear monitors have a well-balanced soundstage and powerful drivers. They were designed for live musicians, and it’s safe to conclude that they’re amongst the most convenient monitors out there due to the exquisite MMCX connectors. It appears that these in ear monitors won’t work so good for drummers or bass players – the lows aren’t as pronounced, and you might need to turn the volume up a bit if you want to actually hear them. 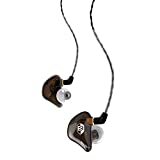 BC100 is a great option if you’re performing live and need a good set of in ear monitors for low cash. They’re decently affordable and do a great job for the money. We’re wrapping it up with Rocuso’s Noise-isolating in ear monitors. 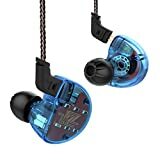 These are very cheap, but they provide deep bass, as well as crispy clear highs due to high-quality drivers they come supplied with. What’s more, they provide excellent ambient noise reduction (not isolation) and boast an ergonomic design – they’re very comfortable to wear and allow you to shut yourself out from the crowd and remain focused on what you’re playing. They’re also labelled IPX5 waterproof and boast remote control options. Even though they’re cheap, Rocuso’s are great for the money. 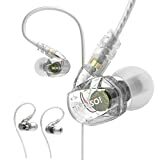 Good sound quality, decent noise reduction and remote control options are enough to label them as one of the best in ear monitors for live performance in the price range. Generally, these are cheap. They’re not flimsy per se, but won’t last for years, let alone more. Great if you’re low on cash, mediocre performance overall – we recommend trying out other options if you’re not in a rush, but these monitors will do the trick if you’re on a tight budget. Picking the best in ear monitors for live performance from a plethora of models on the market is a tough job – there are so many models and but a handful of reliable brands, so what is it that you should do? Aside of spending countless hours on research, you can trust our reviews and take a gander at our top picks! We wish you good luck in finding the best monitors.